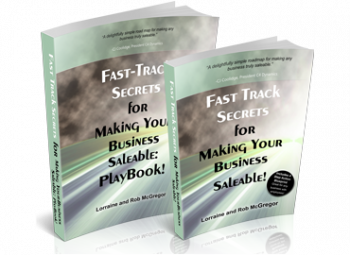 Lately, I’ve been asked how we know what we know about making a business saleable. It’s not a well-known concept. But when we describe that it is all about making a company attractive to the next owner and transferrable, the idea makes logical sense. But owners are not given the insight that their company must be made saleable until they are sitting across from a buyer who ‘won’t be moving forward at this time’, if they are lucky enough that the buyer took the time to explain why they were ‘passing on the deal’. Can you imagine being in the owner’s shoes, hearing that comment after having spent months responding to mountains of due diligence requests, having made the big decision to finally put the business up for sale? Now that’s learning the hard way. Unfortunately, the conventional wisdom doled out to business owners does not contain the concept and action of becoming saleable. The need to do “Succession Planning” has been flogged for too long and now is one of those phrases that has become meaningless in terms of what the supposed action is. Business owners roll their eyes or give blank stares when they are questioned about it. The same can be said for words like “sustainability”, “going green” and “getting on the same page”. These are now throw away phrases that have lost their way. “Exit planning” is quickly joining their ranks… it means something to the people who practice it and nothing to the people who really need it and don’t know it. So what message do business owners receive that does get through to them? 2. When ready to exit, call a business broker or an M&A professional or an Investment Banker. “I’ve get three letters or calls from these guys every month so obviously they know I have a great company and they’ll find me a buyer when I’m good and ready, no problem”. So how come we talk about becoming Saleable? To answer that question, I have to tell you a story. I am a management consultant in a firm that specializes in growing businesses to the next level and helping them make the changes inside the business so it becomes transferrable and saleable. 13 years ago, our clients were getting to the point where they needed to know how to get a return on their investment in their asset called ‘a business’. I call it an asset to remind owners that it is a separate entity. I also do not distinguish between ‘family business’ and ‘business’. Both need the same foundation. Both have to make promises to customers and deliver on them effectively in order to earn income, and then manage the delivery process in a way that produces a positive and growing bottom line. I joined the Association of Corporate Growth in 2000 as one of the few management consultants so I could understand how a buyer searches, selects and acquires mid-market businesses. This is the premier association of deal makers – all the professionals involved in the transaction between buyer and seller. At first, I had no idea what they were talking about their jargon is so extreme. A business is a deal, not a collection of hearts, minds, creativity and passion. Hundreds of deals are looked at to find the 2-3 that are acquired. That means hundreds of owners are rejected and left at the curb the year they had hoped retirement funds were close at hand. I listened to advisors talk about succession. No where did I hear in their discussion about how a company becomes one of those 2-3 selected. I also talked to the lenders who fund employee and family business buy outs. They can’t lend to a business unless a company has been made saleable and transferrable. We took this knowledge and developed our own consulting program on how to become saleable and had considerable success transforming unsaleable and inconsistently profitable companies into buyer’s catnip. These sold for 2 or even 3 times what they were worth just 18 months to 36 months after making our recommended changes in the business. So after ten years of seeing the disconnect between buyers and sellers and advisors, I told my husband and business partner (oh, I guess we are a family business too), that we have to write the book. We need to show business owners how to make their companies saleable so they are attractive to the next owner and transferrable so employees or family members can step in. As an aside, we are firm believers that any family member should make an offer as an arms length transaction, not be given the business. Bequeath the wealth in the inheritance and let the child choose to be in the business and anti-up like any other entrepreneur has to. Learning to take smart risks is an essential skill for any owner. A family member who is gifted that business doesn’t get that learning opportunity and therefore is unable to make critical ‘informed by experience’ decisions. 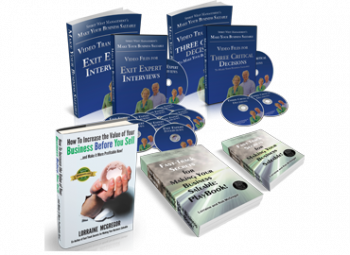 Back to my story, we’ve now written three books and developed a self-guided program called “The Make Your Business Saleable Resource System”. Over the years we’ve been keeping track of the number of businesses that have succeeded at selling. It’s 10%. That means 90% either never find a willing buyer or don’t close their deal with a buyer. Buyers tell us that many owners are not psychologically prepared to let go when it comes to the final hours before signing the papers. If you think about the fact there are 3.6 million businesses owned by people close to retirement age and then add the failure rate this is a mighty big problem to solve. This big transition of wealth experts have been predicting is not going to happen unless we change the nature of the discussion we have with owners. We are inspired, compelled, driven even to get the message out there because of this high failure rate. Think about it: The sad truth is, unsaleable businesses melt in value. And that wealth isn’t claimable. An owner that has tried to sell and can’t may slow down. The business shrinks and adds to unemployment rate. So here’s what we’re doing to drive home the message. Up next, we will be launching peer mentoring groups. Owners who join the group will spend 18 months working through our 4 step system and make the changes inside their business that will make it more profitable and saleable… ready when the ideal buyer comes to call. These owners will have far greater certainty than the majority of business owners that their company is saleable, transferrable, more profitable and will attract the ideal buyer who is willing to pay a premium for that business. 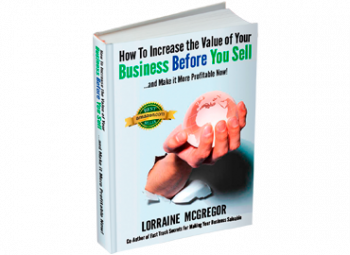 owners in your life: don’t wait to become saleable. Don’t just do a succession plan if you want a return on your investment in your business. What do you think we should do to get the word out to owners to correct their assumptions they have today? We’d love to hear your ideas and suggestions.